The U.S trucking industry invests around $9.5 billion every year to improve safety, which covers expenses of safety training, safety technologies, safety compliance, and driver safety incentive pay. The most important rule that is embedded in safety training is ‘three points of contact’ with the vehicles at all times. It can potentially save a driver from getting an injury during entering or exiting a truck. Moreover, three points of contact are also useful when mounting and dismounting equipment and trailers. Why are 3 points of contact important? When a driver is getting out of a truck or trailer, an impact force is created on their body. Our body is able to absorb a certain amount of force, however, developing a habit of using incorrect technique can significantly increase chances of getting an injury. The impact of injury can depend upon several factors such as weight, age, work practices, and impact force on the body. Main factors that determine impact force are weight and vertical distance; the lighter a person, the lesser the impact force will be. Similarly, the lower a vertical distance, lesser the impact force will be. For instance, a person weighing 250 pounds jumping down from a vertical distance of 16 inches will create 395 pounds of force while the same person jumping down from a vertical distance of 33 inches will create 1,170 pounds. 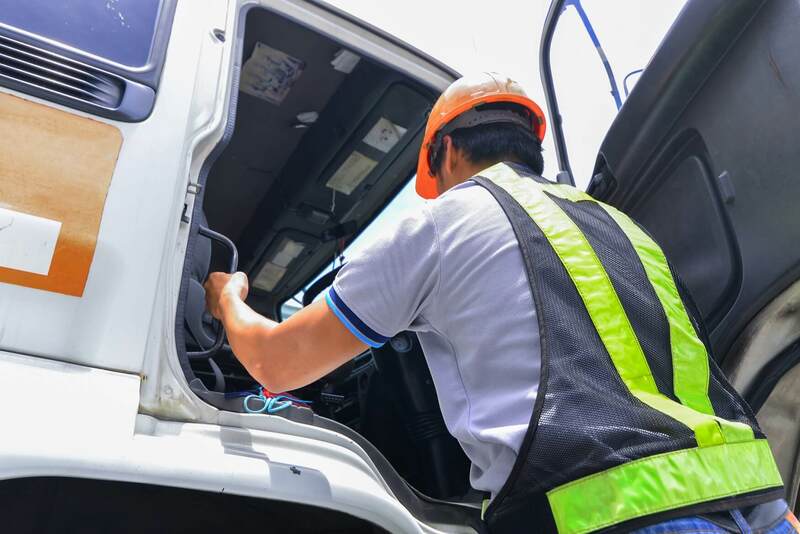 In order to ensure safe entrance, exit, mounting, or dismounting equipment, a driver must maintain 3 points of contact with vehicle. This may include one foot and two hands, or one hand and both feet. For example, both feet should be firmly planted on the steps meanwhile one hand should be grabbing a solid object such as grab handle or steering wheel. The other method is to have both hands grabbing a steering wheel and a grab handle while one foot must be resolutely placed on the step. Following these techniques, widely regarded as 3 points of contact, can reduce probabilities of falling or slipping and also limits impact force on the body, which may save a driver from potential injuries. It is beneficial for any trucking company to obtain services of professional risk management company to devise a comprehensive risk management solution and train drivers about safety rules pertaining to daily operations. This may, consequently, reduce a decent number of injuries which may have been caused due to carelessness of drivers. If you want to find out more about how you can safeguard your business by reducing its liabilities or wish to find more about effective risk management solutions, contact Suburban Insurance by calling at (630) 325-4000.